NOTE: The device that you want to connect must also support WPS. The Linksys app supports Android™ and iOS devices only. Log in to the Dashboard with your Linksys cloud account or you can also tap on Log in with Router Password. For complete instructions on how to access your Linksys Smart Wi-Fi Router using the app, click here. To access your Linksys Velop, click here. On the Dashboard, tap Wi-Fi Network. NOTE: You may also tap the Menu icon at the top-left hand side of the Dashboard to access Wi-Fi Settings. Tap the Connect a Device With WPS option. 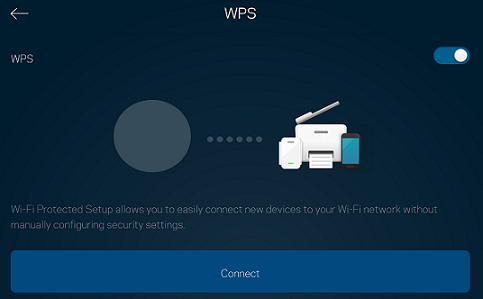 Tap the Connect button to start WPS pairing. Make sure you do the same on the device you want to connect to the network. Once you press the Connect button, a 2-minute countdown begins. When the device is found, the Device name will appear on Devices. When the slider button is set to OFF, WPS will also be turned OFF on your router or node and the following message will display. NOTE: WPS is NOT available when your security mode is set to WEP, MAC filtering is ON or Broadcasting is OFF. You should now have connected your device via the WPS.